It’s been standing on the lawn in front of the Macdonald-Harrington building since last fall. You’ve seen it, the large but oddly graceful twisted wood and metal structure that most passersby can’t make heads or tails of. Listen closely and you’ll hear them say, “what is that thing, anyway?” That thing,” it turns out, is the ContemPLAY pavilion, designed and built by 15 students in the Master’s of Architecture Directed Research Studio program in collaboration with the School of Architecture’s Facility for Architectural Research and Media Mediation. 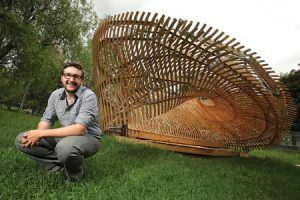 “That thing,” it turns out, is the ContemPLAY pavilion, designed and built by 15 students in the Master’s of Architecture Directed Research Studio program in collaboration with the School of Architecture’s Facility for Architectural Research and Media Mediation. But that doesn’t really answer the question as to what it really is, or does, does it? it will come down before then, hopefully in time for Convocation. A capstone project from a Selected Topics class, the design portion of the ContemPLAY project got underway in the fall of 2010. The students initially split into three design teams before settling on one to work on as a group. The design is a mobius strip, a geometrical form that is a continuous surface. The plywood cladding is designed to create a moire effect, a visual interference pattern created by laying grids over each other. The design portion of the project was completed about a year ago. The project was due to be completed some time ago, but has changed scope a few times, leading to several delays. The ContemPLAY pavilion was originally designed to be dismountable, and there were plans to donate it to the City of Montreal. “But considering how long it’s taken to erect here, and some of the hitches we’ve encountered along the way, I don’t think it’s going anywhere anytime soon,” Hruby said.